We bring forth our vast industrial experience and expertise in this business. This range is widely appreciated for hassle free working. By employing the original DSP technology, which eliminates the self-noise of the microphone with preamplifier, the lower limit of measurement has been drastically extended to lower than 0 dB-SPL. Linearity range, extended to 100 dB in the usual state, further expands to that corresponding to the measurement range 80dB(A) by holding the 0-dBfunction in ON position.It enables to measure ultra-low sound pressure level, so displaying its greatest power as inthe quietness measurement of, or tone quality evaluation of, various silent-type IT/O equipments, as well as in the measurement of air-conditioning noise or sound isolation in a concert hall with ambient noise below NC-20. 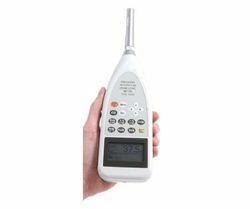 Measuring noise really does not have to be complicated, even for the novice, and the Castle 6224 (Class 1)Integrating sound level meter is designed with this in mind.The meter is ideally equipped for carrying out Noise at Work Risk Assessments, as well as the majority of environmental survey work. The range of parameters measured, the wide measuring capability of the meter and the ease of use, mean that this equipment is suitable for anything from aircraft noise to lawnmower design, and from construction sites to laboratories.Noise at Work Measurements The Castle 6224 provides the essential measurements required by the Control of Noise at Work Regulations2006, including Leq (equivalent continuous level) in ‘A’ and ‘C’ weightings, and Cpeak. The meter candata-log any of these parameters in up to 10,000 data-memories, making it more than powerful enough for the task in hand.Environmental Monitoring Also ideally suited to environmental monitoring, the Castle 6224 can measure 5 selectable percentile values and sound exposure (LE). 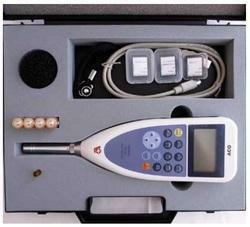 Most environmental measurements require Leq and L90 plus possibly one or two other measurements. These can all be measured simultaneously with the Castle 6224 and data-logged into its 10,000 data-point memory.Multi-purpose Measurement Many sound measuring tasks require the measurement of Leq (equivalent continuous level), Lmax (Maximum rms level), LE (Sound Exposure) or percentiles,and all of these can be completed using the Castle 6224 with its accessories.Operation The Castle 6224 (Class 1) Integrating Sound Level Meter has an easy to follow menu system and clearly marked keys, all designed to make the meter simple-to-use. The back-lit LCD display is also very clear with large figures and a quasi-analogue display bar to show the changes in sound level as they happen. The flagship model of the Pocket Sonus Meter range is the class one Sonus GA116L which is a full data logging, integrating sound and noise exposure meter (dose meter) which has been designed for both Noise at Work assessments and Environmental Sound monitoring. Simply unplug the sound meter pre-amplifier and plug in the dose meter cable which is available as an optional accessory to convert to a fully functional dose meter. 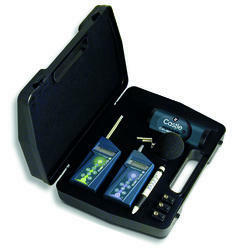 It has the capability to combined sound and dose meters with time and date stamped data logging. The meter features dual measurement, so two versions of most parameters can be measured simultaneously. This feature means you only need to measure once and for Noise at Work assessments you’ll have the correct parameters recorded to determine suitable hearing protection using the HML method, a function available in dBdataPro software. 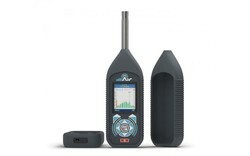 Connectivity is via high speed USB and the meter ships with free noise analysis software dBdataPro-Lite and download cable. Ideal for making noise exposure measurements, the dBadge2 is a shoulder worn dose meter that measures all workplace noise parameters simultaneously. Measurements in accordance with CFR 1910.95 (USA), ISO9612:2009, L108 Controlling Noise at Work. The "Intensity Inspector Sound Power" determines sound power levels of noise sources using sound intensity measurements according to DIN EN ISO 9614-2 and sound pressure levels at workstations according to DIN EN ISO 11201, 11202 and 11205. This sound power information DIN EN ISO 9614 is required e.g. for the CE identification for machines. The easy-to-use software guides you with image and text through the standardized sound power measurement, so that even unexperienced users can perform the acoustic measurement correctly. The Intensity Inspector Sound Power software guides the user step-by-step through a standard measurement. An application-oriented and user-friendly interface guarantees a fast and flawless operation. Criteria for determination of accuracy class are being monitored through the measurement so that faulty measurements are avoided. The test sequence as well as the automatically generated report layout can be customized to your application needs. It brings the power of wireless technology to sound measurement. From one button, all your measurement results are on your fingertips - plug the meter in and simply copy a csv file to your computer. Measuring environmental noise often involves working in bad weather and at difficult locations during unsociable hours. The instrumentation employed needs to be tough, weatherproof, designed for the purpose and easy to use. With every Castle dBAir Environment Assessment System you’ll find exactly that. Specifically designed to help you with assessments to BS4142, site noise survey reports, local authority complaint measurements and much more, these dBAir Environment Assessment Systems are the result of nearly 50 years of knowledge and experience with noise in the environment. Although Hearing Protection Assessments can be carried out using SNR and HML, the addition of 1/1 Octave Band Analysis provides the user with the most accurate method possible ensuring staff are properly protected. 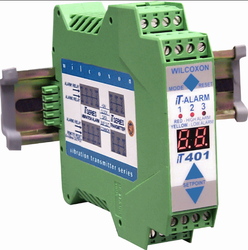 The iT401 is the first alarm module designed to work with any 4-20mA loop-powered device and/or the iT Series sensor signal-conditioning modules, providing easily-programable relay activation for use in condition-based monitorinng or process control. Digital technology, along with simple face-panel push-buttons and a bright digital display means never having to open the unit to alter setpoints. Memory allows user to decide to keep changes permanently, or restore manufacturer defaults. Looking for Sound & Noise Analysers ?